Once upon a time there was a clown who really loved swimming. He participated in important competitions all over the world. He was a very good swimmer and he also dressed up as a clown in competitions, and that´s why everyone knew him as the swimmer clown. He was one of the best swimmers in the world, actually, and he won any competition he wanted, nevertheless, everybody knew what he did in every competition. The swimmer clown always stopped at the last moment to let the second swimmer win. People wondered why, but he never said anything. 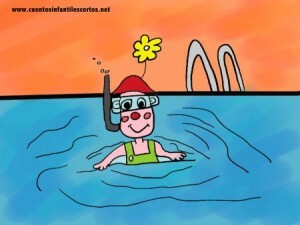 The swimmer clown answered: “It´s not about a circus performance, it´s about the value of being kind to people”. The journalists were open mouthed and the next day the newspaper headlines were: “The swimmer clown, the kindest person in the world!”. The swimmer clown felt better being kind than winning competitions, and he conquered everyone’s heart.